Nantahala River Head Guide Kim hails from Arkansas. With 8 years of whitewater experience and degrees in Outdoor Leadership, Parks and Recreation Management and half of her Masters in Health Education done, Kim's life revolves around the outdoors. 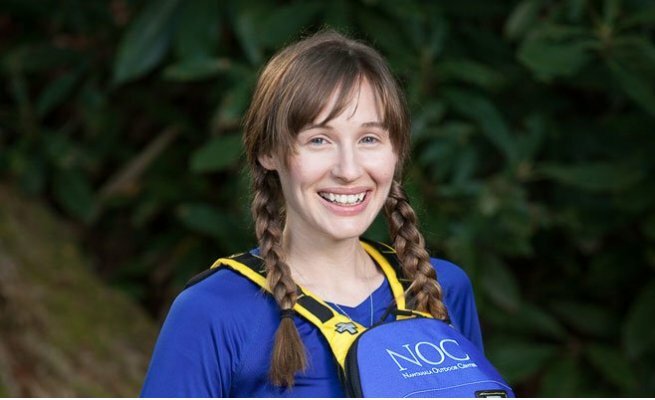 And with River Rescue Pro, Wilderness First Responder and CPR certifications, Kim is ready to handle anything. When she isn't guiding, Kim can still be found in the water practicing her open-canoe skills. And with a 2nd place in the 2012 ACA Downriver Nationals and 1st in the 2013 Nantahala Canoe Club Cup Challenge, its paying off. When she does have a “dry” day, Kim can be found tearing up the local mountain biking trails, practicing yoga, cooking or making jewelry.